Looking for a beautiful, mountain retreat or a year-round property in Breckenridge, CO? Then I have a wonderful property for you! This lovely corner unit in a very well-maintained complex provides privacy and a gorgeous setting without sacrificing any amenities. This 1-bedroom townhouse has been recently remodeled and is updated with new energy-efficient windows. There is also a walk-out patio so that you can enjoy scenic views. Plus, the oversized bedroom will give you plenty of space to relax. The neighborhood around this property is one of our favorites in Breckenridge. 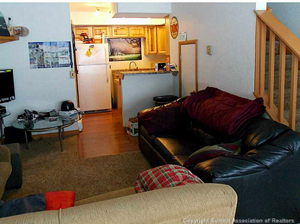 The unit is right near the free ski shuttle bus stop, which means you have access to the mountains and to downtown Breckenridge in just a few minutes. While your home will be nestled in natural surroundings, you’re only minutes away from the charming shops and restaurants on Breckenridge’s main street. The fact is whether you want a vacation home or a property you can live in year-round, this delightful townhouse is capable of accommodating you and your family part time or full time. It’s a great property that you’ll be able to enjoy for years to come! Want More Info on This Breckenridge, CO Property? If you’d like to check out this enchanting, Breckenridge property for yourself, just let me know. The property is ready to show, and won’t be around for long. Give us a call and we’ll schedule a visit that works with your schedule. Also, if you want to view other Breckenridge properties or homes throughout Summit County, we’re happy to put together some properties that might suit your tastes. You’re welcome to browse through the updated listings on my website to get started, and when you’re ready to put together a portfolio of properties you like, reach out and we’ll set up the showings.